Hi nerds, I’m going to let you in on a secret, 9 times out of 10 when I review a place it’s in the one hit. Bam, reviewed. Sometimes, though, I go into a place to review it as I can easily get caught up in something while I’m reviewing it, so I’ll review it in two visits (my mates not to mention Nerd 2 do get annoyed at times when I pull out a note book / camera while having a coffee). 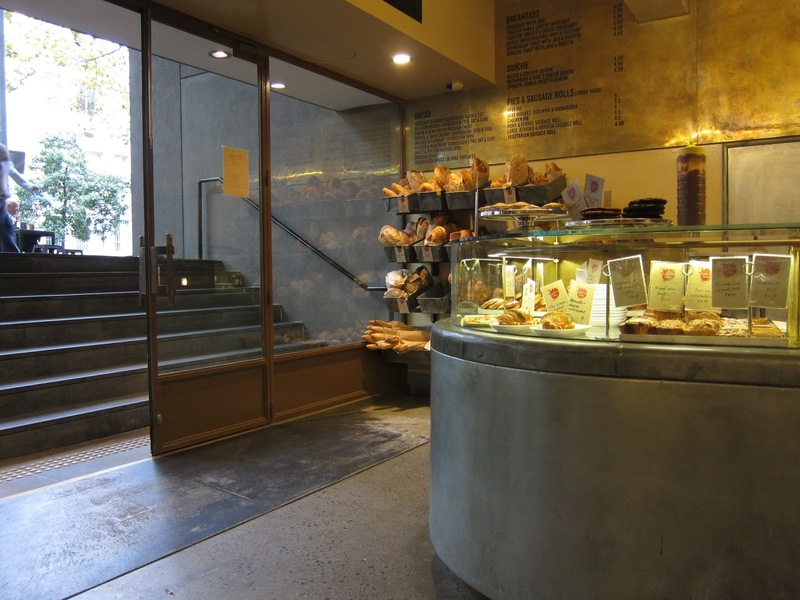 Bourke Street Bakery in Potts Point was one of those places, that I’ve come back two twice. 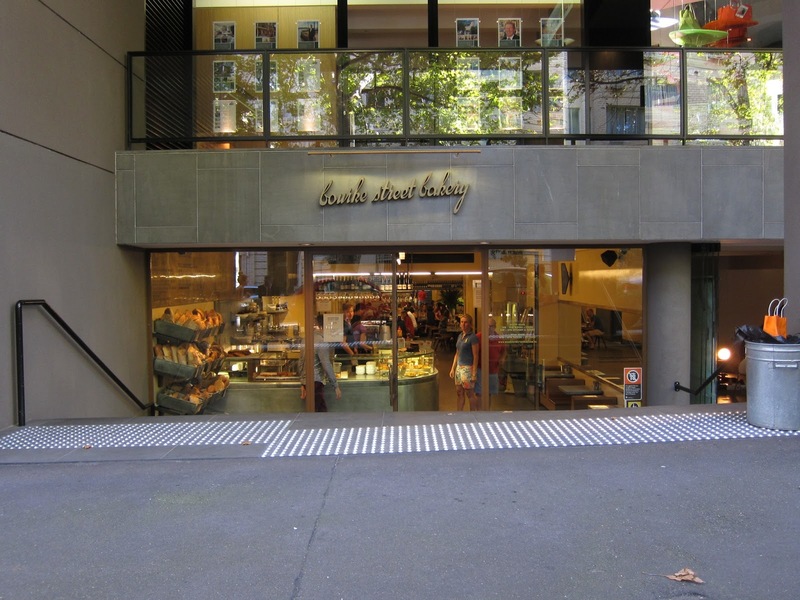 Bourke Street Bakery is a name many of us Sydneysiders know well and a cafe few of us could really locate if placed in Surry Hills (well walking up and down Brouke Street we’d find it eventually). We all know it because, as inner city nerds it’s great for the pastries and bread and second there is one seemingly around every corner in the inner city these days. My official review starts on a wonderfully sunny Saturday afternoon. Nerd 2 having gone off to save the world with her NGO left this nerd to play. Once Nerd 2 had left, I wondered down to the road looked at some stuff at the market and than went right in to BSB and ordered a latte. Let’s stop here for a second. This was not as easy as it sounds. BSB is the only café – like bar I’ve ever been to. What do I mean? While the staff do a very good job-serving customers as they show up. Some customers like to push their way to the front of the bar to get served faster (like getting beers at a pub), I was bewildered and very amused as a elderly man pushed me out of the way to order a sit in latte. Anyway back to the review. Luckily for me on this review I brought my notes with me, like any good nerd will do. And so for this whole review I could case up their long black vs latte. About 3 mins having ordered I spotted 4 lattes coming my way (one for the old guy who pushed his way to the front), 1 for myself 3 for two tables next to me. Firstly, constancy is a hit here, as 4 lattes were brought out all more-or-less right on the mark. From the outset just looking at mine, we can see the layering of my latte was little off, a with just too much milk, looking around though, those other three me were right on (it is hard when you make milk to do 4 lattes). While not decorative by any means the colouration in the foam was quite pleasing to the eye – being circular rings from the pour, I liked it. You’ll also see the brown Campos saucers continue their trend in making an appearance on my blog. Who ever makes these plates clearly is making a killing. My long black’s appearance from before, I noted, had a nice crema, although was a little messy, in that much of the crema had been pushed onto the edges of the cup. The aroma of both coffees was a rich a combination of both sweet / sour fruits. 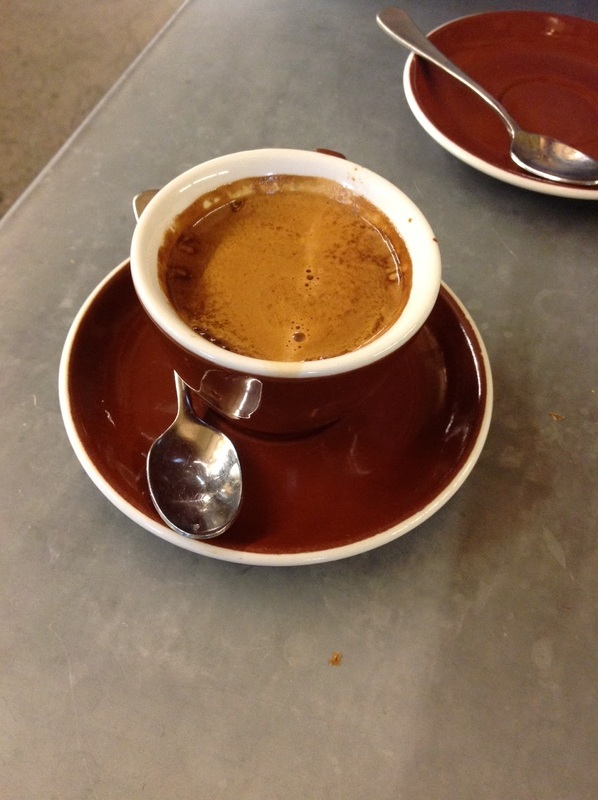 As you’d expect, the long black’s aroma was far stronger and more punchy than the lattes. Tasting it I found both had a bit of a sour cherry to slight coco bitter thing going for them, more so with the long black than the latte (sugars in the milk clearly offsets this sour taste somewhat). There is a nice lingering flavour to the long black and a smokiness that tended to slightly creep up your nose as an after taste. I did not really find this to be overly the case with the latte with the aftertaste not dominating much and lingering more in the mouth. Leaving it to sit I found the acidity increased and this resulted in a more of a sour than sweet experience x2 for the long black. It’s clearly a coffee made to grab a sweet tart with (not that this should be a big problem for you at BSB). The smoky nose sensation remained with the long black when left sitting, great fun. One of the great experiences here, the bread and baked tarts aside is the people (as you’ll note from my earlier experience). The café seemingly attracts all the great variety of people who live in the suburb, bizarre people watching at it’s best. Overall, while the café is going to draw you in for its bread and tarts during the day and its ‘after-hours’ food at night, BSB in Potts Point is just a great spot to be at. A huge internal space, filled with the smells of baking bread, makes way for nice street side chilling outside on open wooden tables on the cul-de-sac road. 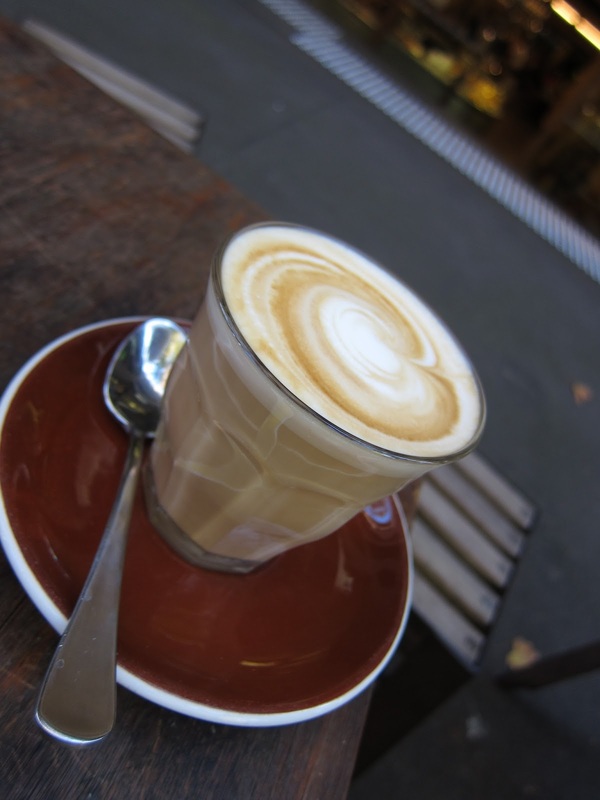 For a suburb known for its quality cafes there are few that the casual and/or solo coffee drinker will feel more at home and more confortable at. The coffee, while not styled like Campos or tasting as good as Alchemy hits the spot every time. If you visit here over the next few months, you’re more than likely to find me here as well. Handy review thanks mate. Will pass this on to the barista.